Much of Oregon's beauty can be captured during the summer months., but its seasons impress me the most. Summer, Fall, Winter and Spring offer unique filters to every day adventures. A popular waterfall in the Columbia River Gorge can transition from being practically non-existent in August, to packing a powerful punch in November. More specifically, Multnomah Falls reshapes during each season. You will find beautiful colors surrounding this area in Fall, but as the temperature drops, the waterfall reaches a freezing point. This creates a unique experience for such a large waterfall. Eventually, the ice secures a fresh coat of snow. Once again the outfit changing its appearance. But this view doesn't last long. As the temperatures rise and the spring season ensues, the snow and ice sheds away. 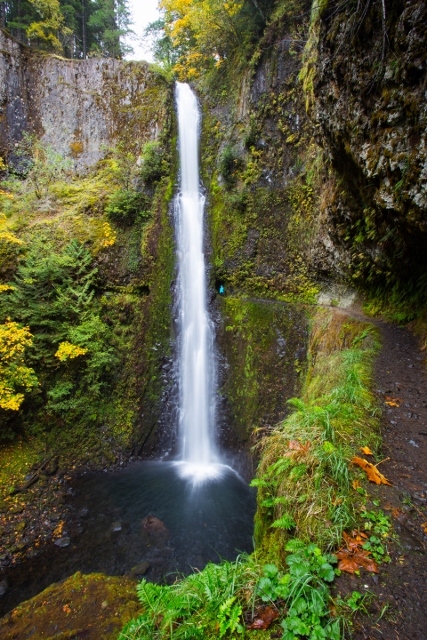 A short drive away from Multnomah, you will encounter similar changes from Fall-to-Winter at Latourell Falls. But bring your traction, the walk way becomes quite slick with the thick layer of ice. Impressively, at every waterfall in the Columbia River Gorge the beauty is magnified. Each season reinventing the scenery. Elowah Falls transforms from being a route for hikers and trail runners, to a trail that is extra slick. Getting to it when the temps are above freezing is a piece cake compared to when a thick layer of ice forms. Traction on your shoes typically circumvents the ice problem. Luckily, the ice and snow sticks around for no more than a couple of days. So if you hear potential freezing temps hitting the Portland-Metro Area. It's time to go to the Columbia River Gorge! A few miles east of Elowah, you will find Wahclella falls transitioning from an extremely popular summer hike, to a less ventured winter one. During an icy morning, the falls develop a mustache. 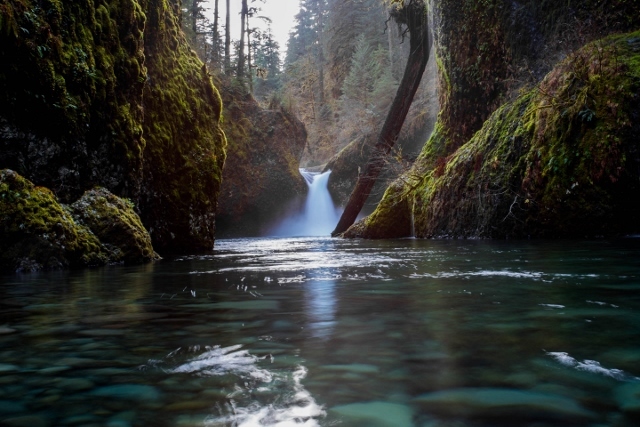 A rocks throw from Wahclella, you venture to the second most popular hike in Oregon, Punchbowl Falls. It depresses to a tiny stream in August, before reenergizing with the rain. Regaining most of its volume during the winter months. But just as noticeable the change is from Summer-to-Winter, it is equally so from Winter-to-Spring. Slowly but surely, the waterfall begins to dry out-- more so these days due to lower snow levels. 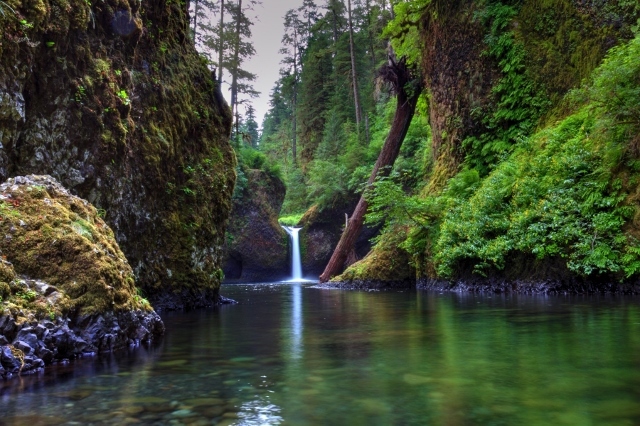 A few more miles up the trail along the Eagle Creek Trail, from Punchbowl Falls you will be led to Tunnel Falls. The change may be measured by the spray from the waterfall as you venture through the tunnel. Navigating a bit further east along I-84 to Hood River, and then south along HWY-35, you will reach Tamanawas Falls. A waterfall that maintains power throughout the year, but experiences an impressive change in color. 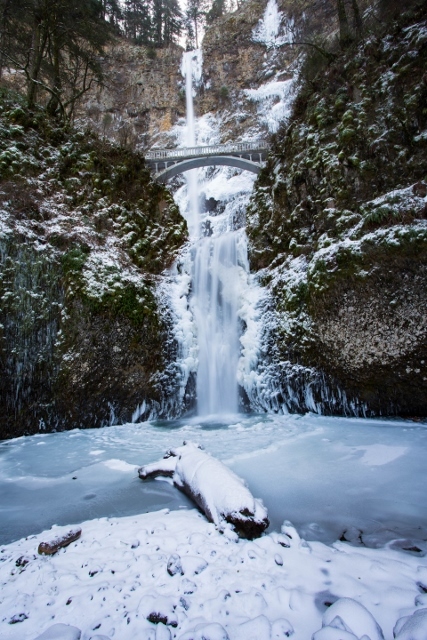 As you venture away from the waterfalls in the Columbia River Gorge, a lake in the Mt Hood National Forest transitions from a popular campground, to a cross country skiing and snowshoeing adventure park. What reflections are lost in the lake, the winter flavor makes up for it. But don't be concerned! At each of the thawing stages, the lake slowly regains its reflective ways. Over in a region near the capital, Abiqua falls, a very popular waterfall during the summer. During the warm season, it serves as beautiful place to cool off. But this atmosphere turns from warm to cold quickly! As the wet season arrives, the rain adds plenty of power to the falls. After Abiqua falls fills up during the wet months, it begins to recede again in early Spring. At this point the weather warms, the rain slows, and the people begin to flock back to this wonderful area. On the more Eastern side of Oregon, lies White River Falls. Whatever amplitude is lost during the summer months, it certainly makes up during Fall and Winter. During the early mornings in February, the mist travels so far that most of the surrounding surfaces turn into a thin layer of ice. Dangerous to an unsuspecting visitor. 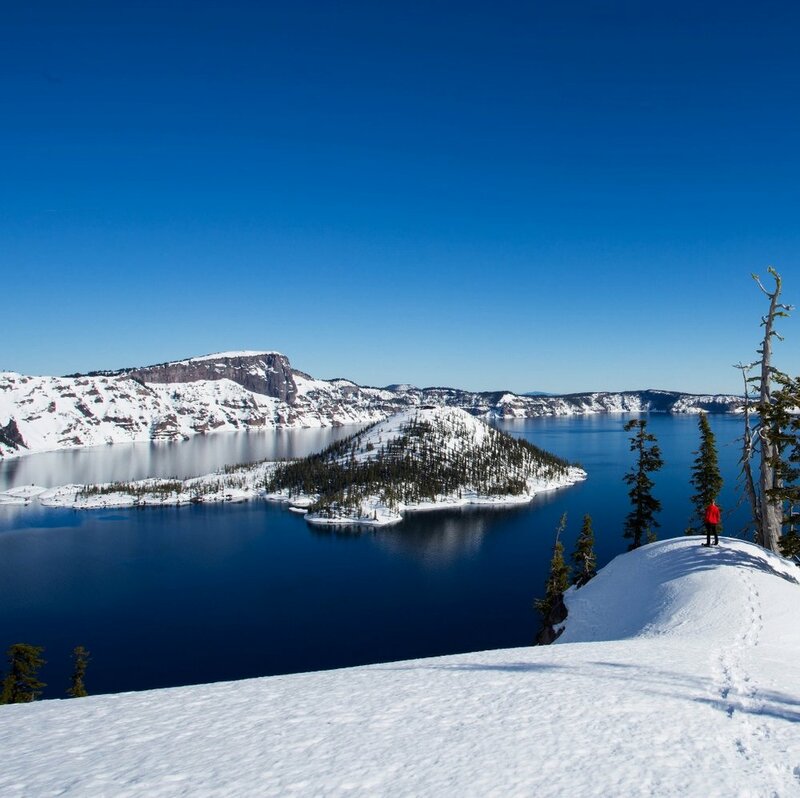 Venturing south and more central in the state, Crater Lake National Park, transitions from a warm summer oasis to a winter wonderland. Visitors thin out as the snow begin thickens. While the snow is on the ground, take every opportunity to enjoy it. Whether it's through cross country skiing, snowshoeing or just looking out from the Crater Rim Village. You will rarely hear and see the park this quiet and majestic. Overall, Oregon with its seasons is outstanding. If you love it during summer, you will certainly love it during the off season (Fall, Winter and Spring). But I invite you to look at the wet season as an opportunity to experience the surrounding beauty through a different filter. What else are jackets for?